You’ve come a real long way since last year, baby girl. I can't believe you're much of a toddler these days . Started walking a day before your birthday, but you just didn’t wanna walk for more than a couple of steps at a time without holding anyone's hand, but after a couple of weeks, you could really walk from the living room towards me in the kitchen... I love you and I always want to be with you but I just can't let you in to my kitchen lol . There are just few dangerous zones over there and I won't risk even a little time of you staying and get hurt after awhile. So there you are, cluttering your dad's fax papers lol But its ok, it always my job to clean your clutters. Just wait til you get 2, coz I will definitely teach you how to clean up your mess heheh..
You are communicating so much too.. YOu talk alot and we just know what you mean (most of the time I guess..) YOu could utter few words clearly since the past month such us "UP, UP" while climbing up the staircase, "PAPA" (you also call me papa lol), "BABA" to every old people you see, sometimes you can say "MAMA" but oftentimes you mean it as your food.... "wang wang" when you see your favorite playmate Maruchan , or whenever you see a dog passing by or even on the tv. You’re indeed a great kid — full of life. You always make me proud to be your mom. Your daddy and I are having so much fun teaching you about the world. Keep on exploring, and we'll always stay behind following you, trying to keep up! time flies so fast, parang kelan lang anzu is still a baby, ngayon she's entering her toddler years na. she's looking more and more like you, such a pretty baby! Sana mabasa ni Baby Azumi itong sulat mo sa kanya pag malaki na siya. Matutuwa sigurado siya nang husto. Congratulations sa 13 months of blissful existence ni baby Anzu. Siya talaga ang apple of the eyes ninyong magasawa. Marami pang nakatutuwang pangyayari na pagsasamahan ninyong buong pamilya. Marami pang nakakatuwa at cute na mga pictures na kukunan ninyo kay Anzu. Thanks for the post. God bless you always. Mommy bamz the more you want them out in your kitchen the more the want to stay there hehehe. Well your Baby dolly is a charm, ang good baby, she is not gonna miss with the pans and pot lol. Enjoy bonding with her, coz they grow so quick. awww this is so sweet! Wow, what a cutie! Happy 13 months! oh my golly gosh gosh...13 month old na si dolly? parang kaka birthday lang nya last week ah...ehhehe! Naku dear, you're in for a lot more fun, excitement and kung ano-ano pa in the coming months. Di pa ako mommy but I took care of 3 kids, and grabe! 2 of them are already 20 and 13 respectively. But it's always nice and heart-warming to see their progress. I featured your blog at my How's Your Blog?. Please come over to my site to see it. Hope you will like it. Thank you so much. God bless you all always. Bambie Dear nakaka touch naman ang message mo kay Baby Anzu...ang sarap basahin ng paulit-ulit grabe! im sure paglaki ni Baby anzu she'll become a sweet & good girl, kase ur so sweet Mom! By the way, Mommy thank you for being one of the sponsors in Her and History contest. Nanalo ako ng 2nd prize. Salamat ulit. I will be back to give more details. Thanks for the comforting words and e-mails,Bambie. I really appreciate it. Give Anzu chan a hug for me! happy 13th month Azumi. Your so cute. Hello Bams, you know di mo maiiwasang pumunta si anzu sa kitchen kasi yan ang pinakapaboritong place ng kids.. they love playing with the pots and pans kasi.. Yan ang favorite bonding din namin ni rye kaya interested syang magluto lagi.. the more you expose here there, the more na makakasanayan nya yung kitchen..
Wow Mommy ang cute naman ng baby nyo lalo na sinulat mo for her - so sweet! Blessings to you and your family too. 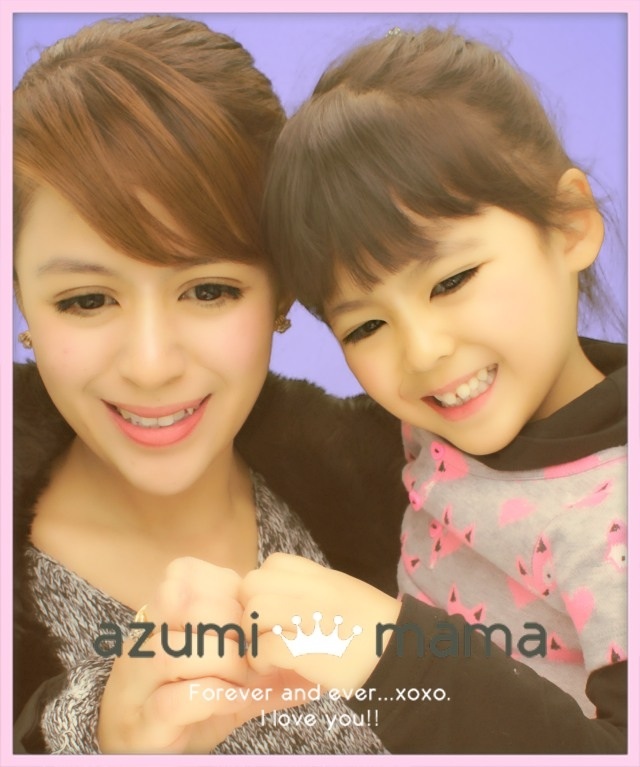 Happy 13th month Azumi chan! happy 13th month azumi! you're so cute!